Living in Manhattan and toting three kids around, a good stroller is necessary! We pretty much walk everywhere; and we need something durable, reliable, easy to use and well built. We log more hours in a stroller than anything else. From the playground to the zoo, to Timothy’s school (and back 4 times a day! ), it can make a huge difference having a good stroller. When it’s easy to load and push the twins around it makes me life so much easier. A durable stroller is so important that can last in NYC winter and summers. Something that can be pushed over rocks and uneven sidewalks. I truly love the founders of Zoe stroller’s mission and that it is a small family owned company. They have seven employees/owners: Mom, Dad, Grandpa, and 4 kiddos and two of the kids are twins. They started the company in 2015 after dad and grandpa worked in the juvenile products industry for a combined 60 years. Mom had a serious stroller addiction and worked as a fashion merchandiser. The Dad, Grandpa, and Mom decided to make strollers that fit the needs of on-the-go parents. 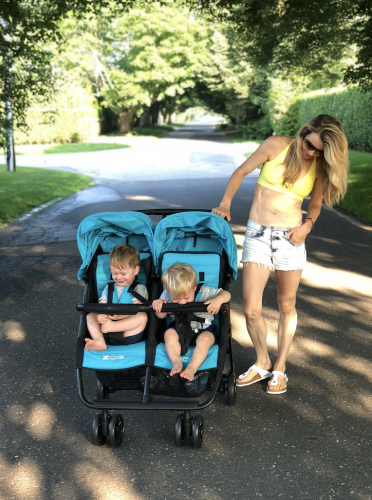 Whether you have twins or little ones close in age, it is really nice to have a great stroller that can make your family’s life easier. They sell high-end products that are stylish, extremely lightweight and easy to use. The founders know how to design expensive strollers without the crazy price tag. They sell exclusively to the consumer. Therefore they avoid the markup that would be required if their products were in big box stores. They provide you with a super nice, high-end, durable stroller. Zoe has really thought about everything and still created a light compact easy to use double stroller. 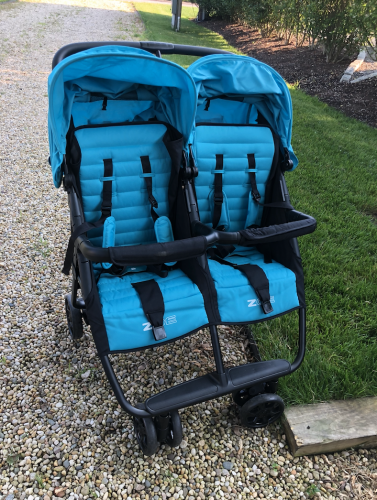 We have the ZOE XL2 BEST v2 double strolller. 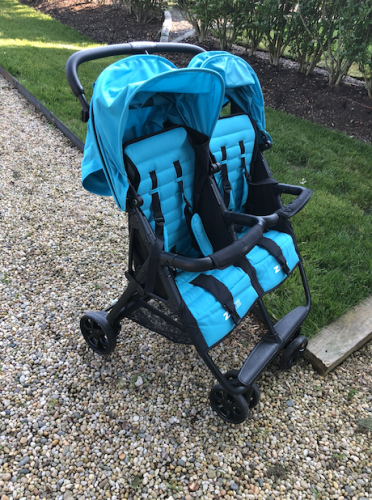 It is the ultimate lightweight, compact, everyday, pop in and out, run an errand, travel around the world, double stroller for on-the-go parents! The ZOE XL2 BEST v2 is Lightweight, Folds with One-Hand, Fits in a Backpack, Comes Standard with Tons of Accessories, Built with High-End Materials, and Priced Affordably! Making a side by side stroller that is still narrow enough to fit through all doors, is not easy. The Zoe is pretty much perfect and fits through everything except for our front door which I have to do a little maneuver through. Our neighbors downstairs own one and their nanny showed me the secret way to get it in the door. The stroller is 40.25″ (height) x 29″ (width) x 34″ (depth). There’s a lot of under space for storage; and it also has an adorable basket that you can use for carrying all of your keys cell phone etc that straps to the handle. We get a ton of compliments on the navy color in the city and the blue one we keep at the beach. The Zoe is truly an awesome umbrella stroller that’s built to last. I remember the first time I spotted the Zoe stroller at our local playground and went home to research it. I had the best customer service ever and can’t say enough about the company. I’ve partnered with Zoe to giveaway one of their amazing strollers!!! Comment below and make sure you’re following me and Zoe on instagram and FB for extra bonus points. Let me know why you would love a Zoe stroller and GOOD LUCK!!! Is Yoga Safe when Pregnant? Thanks for the opportunity! Following you both on FB and Instagram! I’m shopping around for a stroller, so I’ll be checking these out! I would love this stroller for jogging and long walks with my family! It’d be so great to have such a lightweight option for my two under two! Would love this for my grandchildren! This would be perfect for my two under two! Need this for my grandchildren! Following You & Zoe on Instagram! Following on FB. Could use for our growing family :)! We travel quite a bit and this stroller would be awesome! Always looking for a more light weight and compact double stroller. This would be awesome for our growing family. A lightweight double stroller is a must for anyone with two toddler or younger kids in the busy city! Great color choices are a plus.